Well, I broke down and bought a new toy. It is a thermal immersion circulator by Polyscience. What was once in the bailiwick of laboratory scientists, is now showing up in the kitchen of chefs. Food is vacuum sealed in plastic bags and cooked in a temperature controlled bath of water. This type of cooking is called sous vide. And you can read more about it here. So far I have used it to cook meat and salmon. This entry was posted in Cooking on March 30, 2008 by Mark. I am beginning to think that my riding bike is a death-trap. I took a spill this morning. The roads were slightly damp. No problem. 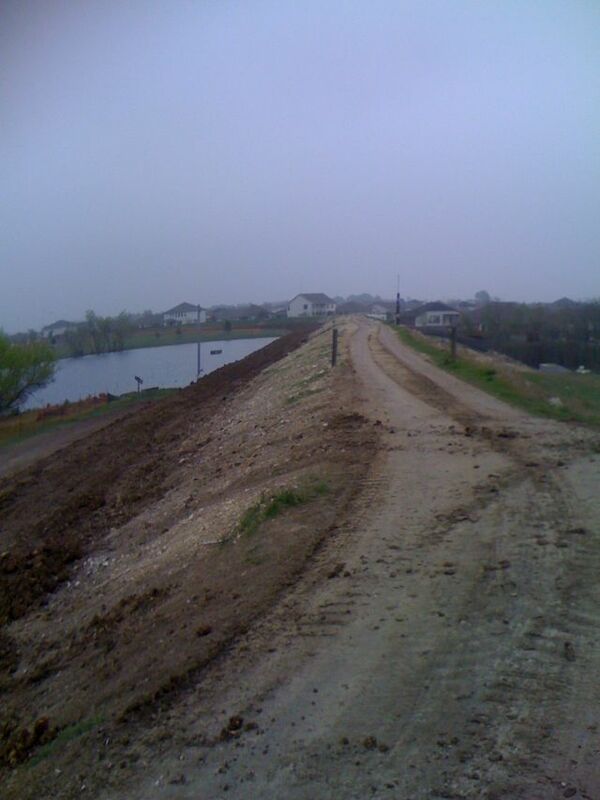 Until I came to an area of new construction and the road was covered with mud. Now my tires are covered in mud, but still no problem. And then I approached an intersection. Once I made the right-hand turn over the concrete, I went down. Fortunately, my hip took the worst of it. A good Samaritan asked me if I was alright. It was all that I could do to nod my head yes. It took me a while to walk that one off. I was going to get back on that horse and continue the ride. But the rear of my bike felt squirrelly. And I wussed out and turned around. The hand-sized welt turned into a nice bruise. This entry was posted in Interesting on March 30, 2008 by Mark. The meetup group went to Old Settler’s Park today. Out of the 8 who RSVP’d yes, only 4 showed up. 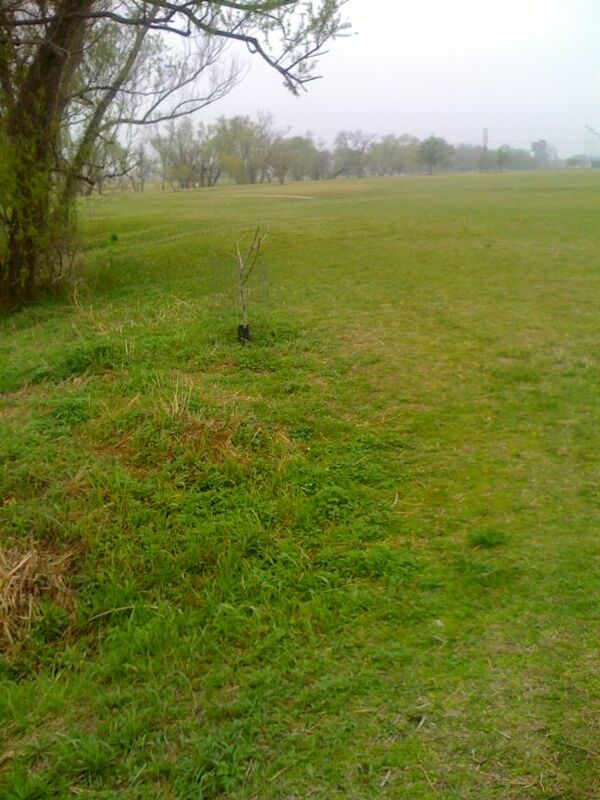 It looks like someone planted a new tree right in front of the tee and in the middle of what little open space there was! Was that on purpose? Or do the employees not realize that there is a disc golf course here? I know strollers in the park don’t. Its been a while since we have played here. And it showed. 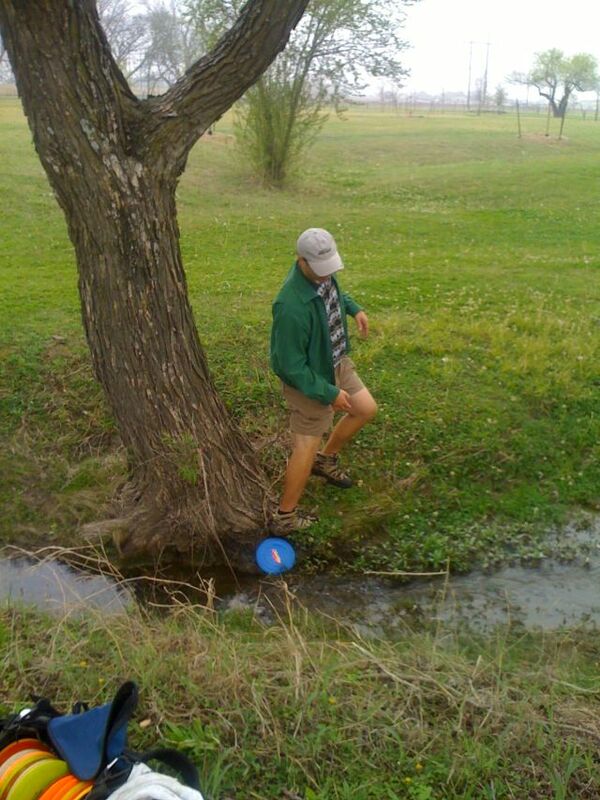 I threw into the water at hole 2 (and had to wade in to retrieve the disk). John did on hole three. Ken did on hole seventeen. There were no birdies today for anyone. Although I had a chance on hole 15. 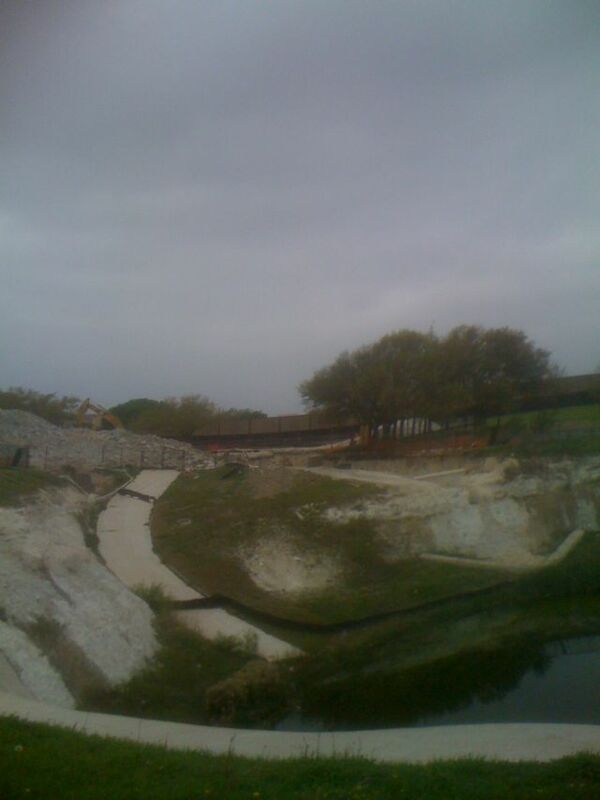 The dam construction is ongoing. They have cleared out all the plants and trees on both sides. I wonder why. Are they going to lay cement on the cleared area? It was also interesting to hear that our new meetup member, Cory, had somehow came across this blog when he was searching for information about the course at the Rivery in Georgetown. They tried searching for the tees and did not find them. So he looked around and saw this blog. We happened to be playing at that course. So, when he told his friend that people were playing it, his friend thought that we were playing a joke. Small world, I guess. It sounded like he only saw the rather poor pictures on this blog rather than the full course photos here. 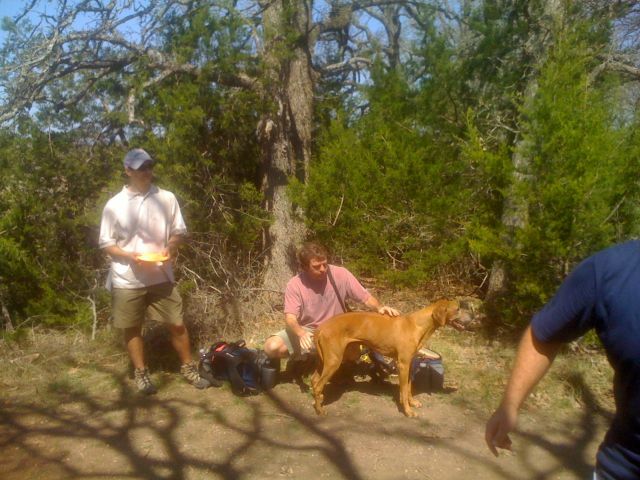 This entry was posted in Disc Golf on March 29, 2008 by Mark. They are really tearing up the IBM site. 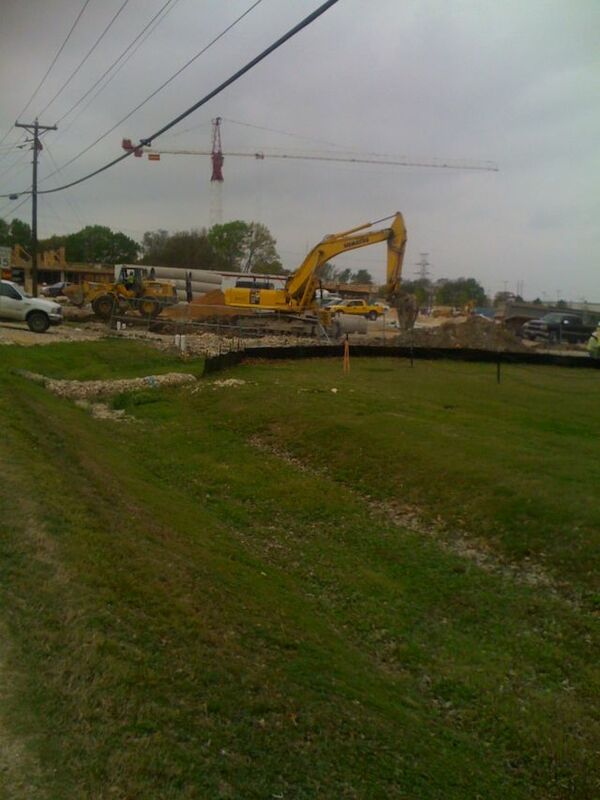 IBM has all but disappeared from the West side of Burnet. Apparently, with all of the new buildings that are being built, they need to beef up the run-off of water. So they are expanding an already huge collection pond to be huger. There is another building going up close to the new road that they put in to access the Domain. This entry was posted in Interesting on March 28, 2008 by Mark. Our first real game was Race for the Galaxy. This time, I started off with Old Earth. And it looked like I should be focusing on a trading/shipping strategy. So I tried that out. However, I started off too slow. It took me a while to get my first planet, an alien robotic factory (cost 6), down. I was able to get down replicant robots (-2 settle) and terraforming robots (1 more card when settle). It seemed that I was quite the robotic -philiac person. No one was producing. That hurt me. And I noticed that it took three turns in order to get a high value card down (produce, trade, develop/settle). I couldn’t really latch on to other people’s selections to help me shorten that cycle down. Also, I didn’t really get down good level 6 development cards. The Galactic Rennaissance and the Galactic Federation didn’t give me huge bonuses. But it was enough to get me 2nd place. It has been a while since we have played Tichu. So sad. I started off with some bad luck. On my first hand, I random-wished my partner’s two-bomb. But he still called and made Tichu. In first three hands, I did not see an Ace. So on the fourth hand, when I had a risky Tichu hand, I went for it. I wished for an Ace to try and promote my hand a little bit. But I called out Jon’s Ace. For the last hand, if we called GrandTichu, made it, and scored more than 35 points we would win. Unfortunately, that was not the case. 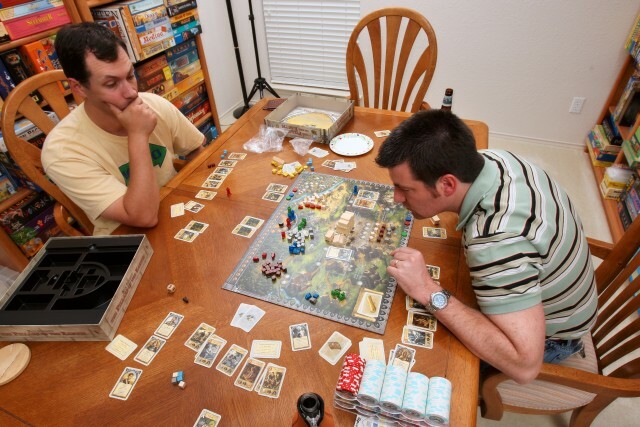 This entry was posted in Gaming on March 27, 2008 by Mark. There were a lot of people at the meetup again this week. Enough for two groups again. We played at Wilco. Curt showed up after a long absence and beat Gravitt, who had practiced at Wilco three times earlier that week. 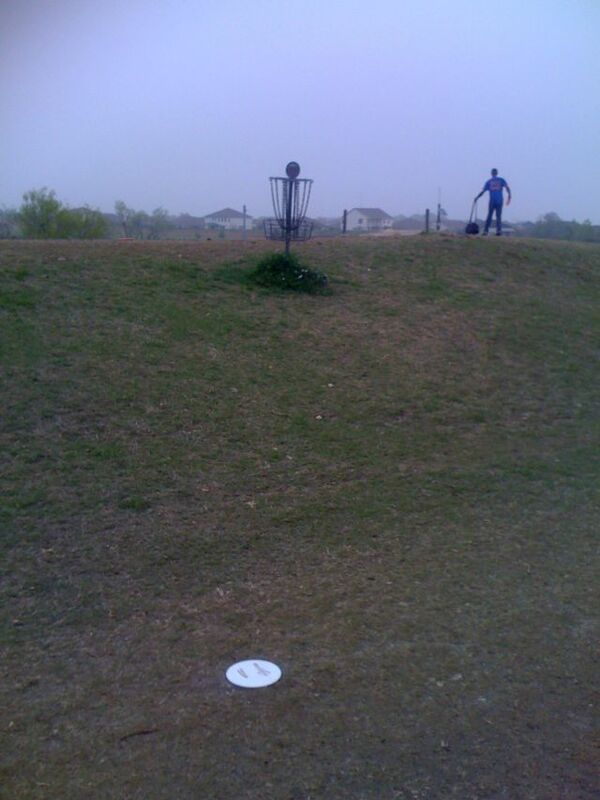 This entry was posted in Disc Golf on March 22, 2008 by Mark. Man, it has been a while since I have played Pillars of the Earth. And I don’t know why. It seems good enough. Although there is less fighting over resources with three people. John introduced us to a three player climbing game called Big Three. There are more combinations than Tichu but no bombs. With sixteen cards, you have more flexibility in what you can play. The winner of an initial bid gets four extra cards and is playing against the other two people. If the winner goes out first, then the other two people give the winner the amount of points. Otherwise, if someone on the opposing team goes out first, then the winner gives both people the points in the bid. 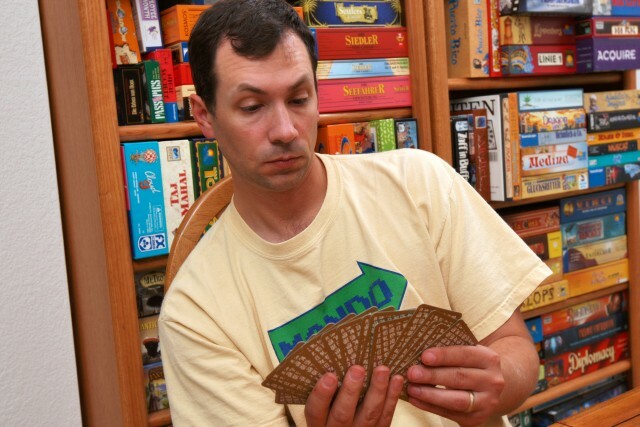 When Jon called last hand, I was ahead of John by 5 points. So John had to make a three point bid and go out first. Fortunately, for myself, Jon and I were able to set him (and Jon did the right thing even though he was last with no hope of catching second place). This entry was posted in Gaming on March 20, 2008 by Mark. Grr! UPS left my package out on the front porch. Normally, there is nothing wrong with that. But, today, it was pouring out. Its not like the rain was a surprise or anything. Why can’t they wrap it in plastic in these cases? Like newspaper carriers do. This entry was posted in Complaints on March 18, 2008 by Mark. The meetup group went to Rivery. This time there were 10 people? Gah! Far too many! My group proved to be much faster that John’s. He was still on 13 when we finished. Jon had left immediately when we finished. No one seemed interested in lunch, so I went off on my own. To Monument Cafe — my new favorite restaurant. 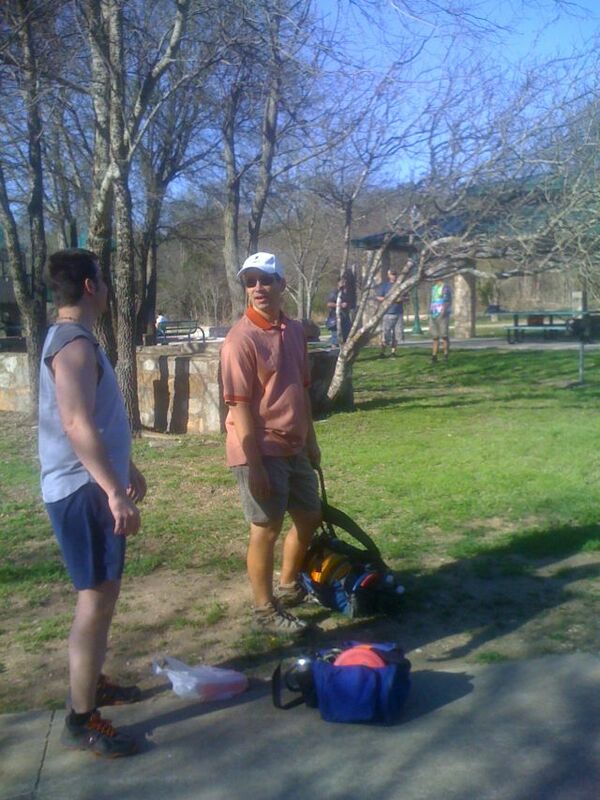 This entry was posted in Disc Golf on March 15, 2008 by Mark. Once in a great while Jon will actually play disc golf on a Friday. He picked a hot one! 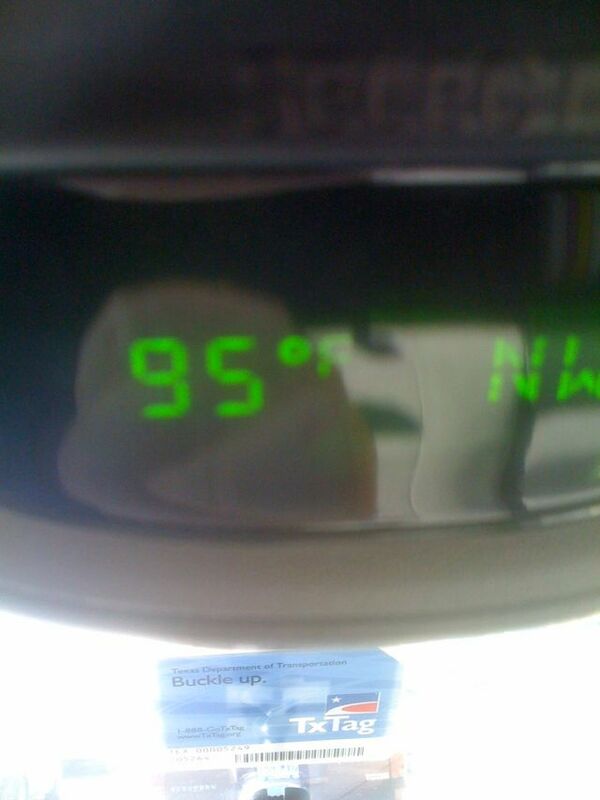 Technically it is still winter, but you would not believe it by looking at the thermometer. Jon met up with Paul Weitkemper waiting at the course and he joined up for a game. It seemed like a small world when we found out that he worked at Tivoli. 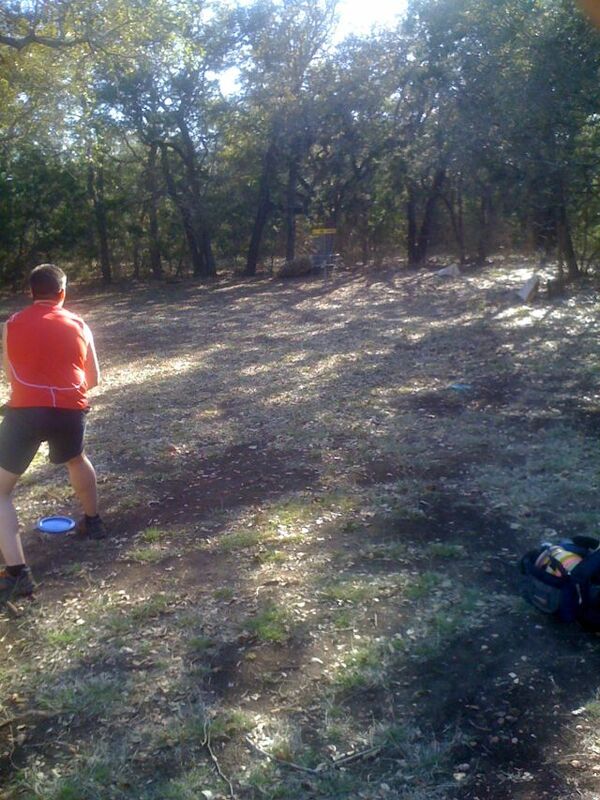 This entry was posted in Disc Golf on March 14, 2008 by Mark.